How you can take advantage of the recent tax reforms to create a Tax-Free Retirement Plan. The top 10 things to consider when planning for your retirement. What 5 mistakes you must avoid with your money. How to build a durable financial plan that works in both good and sour markets. 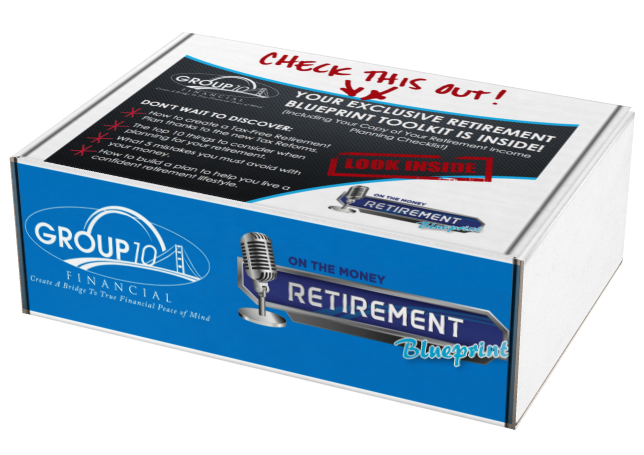 Click Here to Order Your FREE Toolkit Now! Investment Advisory Services offered through Brookstone Capital Management, LLC, an SEC Registered Investment Advisor. Group 10 Financial and Brookstone Capital Management are independent of each other. Strategies mentioned may not be suitable for everyone, information expressed does not take into account your specific situation or objectives and is not intended as recommendations appropriate for you. Information has been obtained from sources that are deemed to be reliable, but their accuracy and completeness cannot be guaranteed. Always consult with a qualified investment, legal or tax professional before taking any action. Investments involve risk and unless otherwise stated are not guaranteed. Past performance cannot be used as an indicator to determine future results. Annuity guarantees are based solely on the financial strength and claims paying ability of the issuing company. Individuals should thoroughly review the contract for specific details of the product features and costs. Income payments and withdrawals from deferred annuities are generally taxable as ordinary income in the year they are taken. Investment advisory services provided by Brookstone Capital Management LLC, an SEC Registered Investment Advisor. Group 10 Financial, LLC and Brookstone Capital Management LLC are independent of each other. Insurance products and services are not offered through BCM but are offered and sold through individually licensed and appointed agents. Investments and/or investment strategies involve risk including the possible loss of principal. There is no assurance that any investment strategy will achieve its objectives. The purpose of this website is to provide general information on the subjects discussed, it is not intended to be used as the sole basis for financial decisions, nor should it be construed as advice designed to meet the particular needs of an individual's situation. Our firm does not provide tax or legal advice, all individuals are encouraged to seek guidance from qualified professionals regarding their personal situation. Who’s Who in Finance and Industry, Who’s Who in America and Who’s Who in the World designations; the flag flown over the U.S. Capitol; and the Honorable Kentucky Colonel designations are all paid opportunities. They are not representative of any one client’s experience and provide no guaranteed assurance or warranty of the character or competence of those designated. Always make financial decisions on the basis of your own due diligence. The flag flown over the U.S. Capitol and the Honorable Kentucky Colonel designations are both paid opportunities. They are not representative of any one client’s experience and provide no guaranteed assurance or warranty of the character or competence of those designated. Always make financial decisions on the basis of your own due diligence.